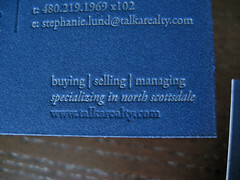 Not your average real estate business card! We’re not afraid of small type! Check out the 2 and 3pt type in the photo. 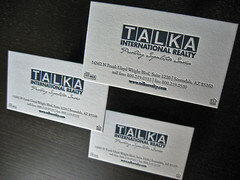 Real Estate companies use business cards faster than almost any other business because they’re constantly meeting people and networking. As a result, a lot of people think that offset cards are the best option. 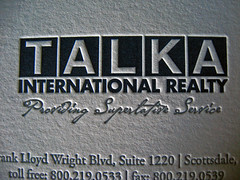 We’re glad to see that there are companies trying to buck this trend like Stephanie and Jason of Talka Realty. 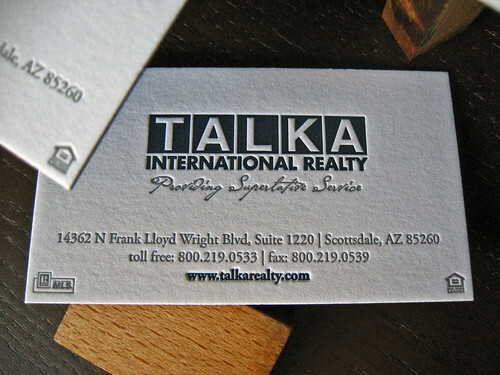 Don’t think that fancy business cards are only for large realty firms, back in May 2010 when we first spoke with Stephanie, Talka Realty was a small Arizona-based startup. 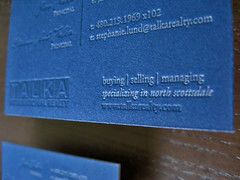 TREND: For clients who hand out a ton of business cards, we usually print one set via letterpress and another set offset. 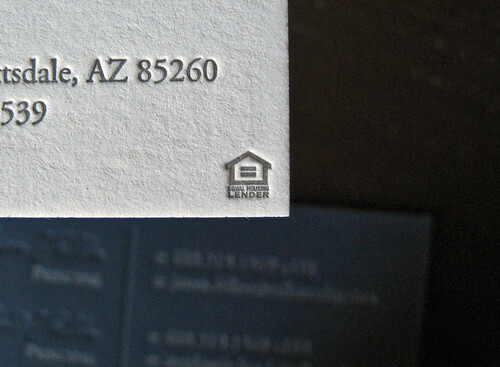 Our offset business cards are printed on high quality stock to match the letterpress stock. For more information on offset and digital printing, email us for a quote (contact@dolcepress.com). Stephanie worked through several iterations of the cards and we discussed issues with printing (paper choice, ink colors, fonts, …) and how each version would be executed. 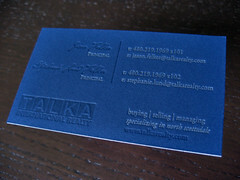 Once they finalized the design, she forwarded us the files and we got to work printing. The final version was a duplexed card with 110lb. Crane’s Lettra (Fluorescent White) on the front and 134lb. Crane’s Palette (Navy Blue) on the back. 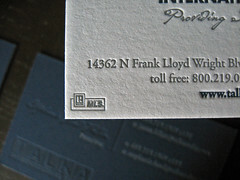 The cards were letterpress printed on a Vandercook Uni III (cylinder press). 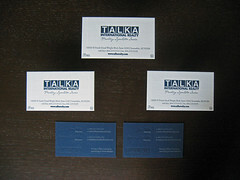 We printed the white and blue paper separately and duplexed them after printing to ensure heavy impression on both sides. Duplexing is great because we can combine two completely different stocks into one card. 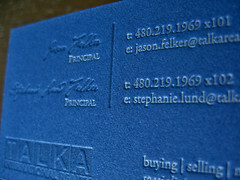 The front of the letterpress cards were printed in 2 colors: a navy blue ink custom mixed to match the Crane’s Palette stock and silver metallic ink. 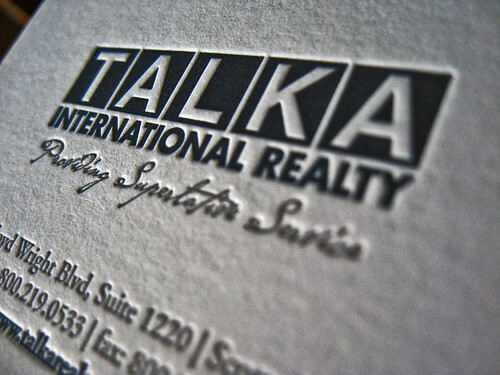 The Talka logo reproduces really well via letterpress with the knockout in the letters creating a faux-emboss effect that we love using on business cards. 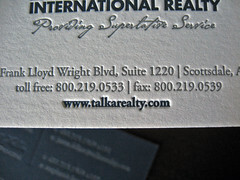 Silver ink especially on small text like this prints more like medium gray. 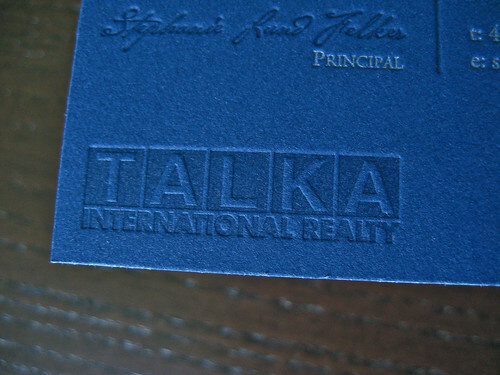 3D Stereoscopic image of the edge of the business cards. Cross your eyes until both images overlap. 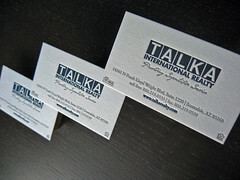 The back of the cards were printed in silver and transparent white inks. Stephanie and Jason opted for a card that they both could use instead of imprinting a subset for her and another for him. 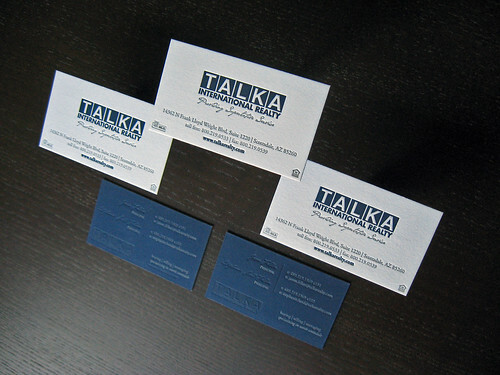 The Talka logo knockout shows up great on the blue stock printed in transparent white. 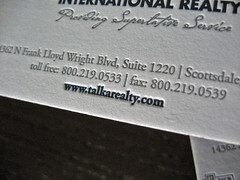 Transparent white ink adds contrast to a blind press and darkens the stock by 1 to several shades depending on the amount of ink we use. We love to read everyones comments so post below! 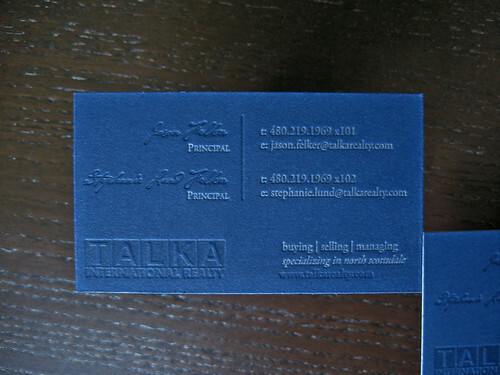 For quotes on custom business card design and printing, contact us by phone or email (contact@dolcepress.com).